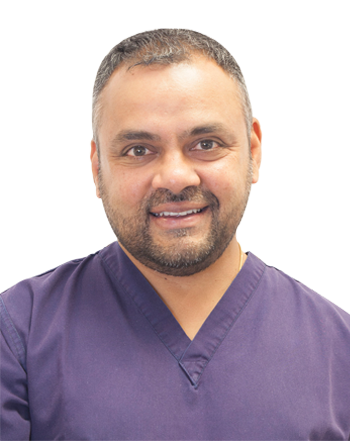 Joe Bhat qualified in 1992 and furthered his training in Oral and Maxillofacial Surgery at some of the country's leading units for five years. During this time he became a Fellow of the Royal College of Surgeons, England. He then undertook a three-year full time specialist training program in Prosthodontics at the London Dental School in 1998. This culminated in a Master of Clinical Dentistry from the University of London and Membership in Restorative Dentistry from the Royal College of Surgeons, Edinburgh in 2001. Joe Bhat regularly lectures both in the UK and abroad on dental implants and is an extremely sought after speaker. He is currently a Fellow of the International Team for Implantology (ITI), Fellow of the International College of Dentists (ICD), Examiner for the Royal College of Surgeons, Edinburgh for the Diploma in Implant Dentistry and Examiner for the General Dental Council and runs his own implant training and mentoring program for dentists in the London area. Joe Bhat and the education team delivering the course have accumulated over 20 years of clinical and teaching experience as well as gaining a reputation for excellence and giving delegates the confidence to place and restore implants using the Neodent® Implant System.